Separating network traffic is vital to the health of a businesses network. Keeping guests in a separate network group prevents malicious usage of the network resources. 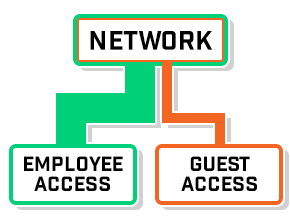 Guest networks give the user less privileges and permissions, which helps to maintain the security of the network and keep safe the valuable information that the business possesses. To prevent network slowdown, the network administrators can implement bandwidth limitations which the user agrees to upon being prompted with the captive portal. The ability to limit the bandwidth that a user uses is crucial to balancing the network load, preventing users who would otherwise use too many resources, such as HD video streaming or downloading large files. A balanced network allows for more users to have access to the network at once, as well as enhanced functionality for all of the users instead of just one using the bulk of the network resources. Data collection has become the norm for businesses of all types and for good reason. Repeat customers, length of stays, and demographics are all categories of data that are commonly collected through a captive portal. This information can allow the business to tailor certain business practices around the most profitable customers. Collecting certain types of data can give a business insight as to what they could do to become a better business. Marketing and advertising can be highly dependent on demographics, so it would be better for a business to use their marketing resources in a much more efficient manner by knowing who their targets are. Captive portals are extremely customizable, with ads ranging from banners to 30 second advertisement videos that must be watched before the user is able to access the guest network. Because a captive portal is controlled by the business’ network administrator, the portal can be designed to the business’ desire. For example, a portal could include a banner, a checkbox next to a hyperlink containing the terms and agreement as well as the acceptable usage policy, and quick links on the side which advertise certain products or specials that the business is promoting at the time. Finding an optimal balance between user experience and business benefit needs to be kept in mind, so it is important to keep the advertisements and sponsorships at a reasonable level. Another benefit of a captive portal is the liability protection. When a user connects to a guest network via a captive portal, they are required to agree to a terms and agreement and an acceptable usage policy. These outline what the user is and is not allowed to do on the network and state that legal repercussions will occur if the user decides to not follow the rules they agreed to in order to do something malicious or illegal. On top of that, these policies include what information the business is permitted to collect from the user. Acceptable usage and terms and agreement policies allow for businesses to set the standards that they desire for their guest network and the user is denied access to the network if they disagree to the terms. 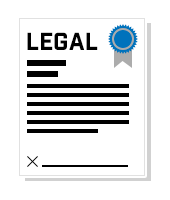 These simple policies help to alleviate liability in the case of a user being a victim of malicious activity or in the case of a user being a malicious perpetrator. Having said that, it is important to understand that some very well-known organizations, such as Apple, don't rely on captive portals or end user license agreements before allowing users to access guest WiFi Internet. One of the biggest downsides to using captive portals is the complexity they add to the user's experience. Typically, having a user fill out a form and click through a screen or two is not a cumbersome task. However, in some cases, such complexity introduces too many steps when simply connecting to the WiFi network is all the user should have to do before gaining access to the Internet or guest resources. Captive portals also introduce another system into the user access process that can fail or get misconfigured and prevent users from gaining access to the network. Prior to implementing a captive portal, it is recommended that the organization understand the pros and cons of adding this step into the guest Internet process. 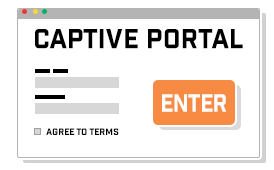 If your organization has no need for marketing, user tracking, and your legal department does not requirement acceptance of acceptable user policy, then a captive portal should not be implemented.